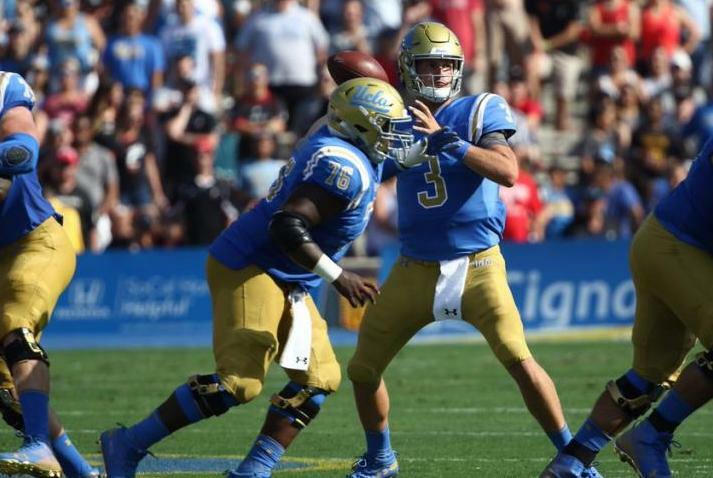 A 26-17 loss to Cincinnati in Week 1 made it abundantly clear that UCLA has much work to do in order to reach the lofty standard Bruins head coach Chip Kelly set in his four seasons at Oregon. Meanwhile, earlier on Saturday afternoon, Oklahoma stepped off the gas in a rout of Florida Atlantic and still scored 63 points. Seems like a potential mismatch this Saturday when the Bruins (0-1) travel to Norman to take on the 1-0 Sooners, which started the season No. 7 in the polls. An Oklahoma offense that looks as dangerous as last season's 45.1-point per game monster could be a terrifying proposition. Kelly believes UCLA will be excited more than fearful. "If you are a young kid, you grow up and you think about Oklahoma and all the great players that they've had and played there and you get to go play in [Gaylord Family Oklahoma Memorial Stadium]," Kelly said in his postgame press conference following Saturday's loss. "If you can't get excited about going to play Oklahoma at Oklahoma, then you are in the wrong spot." Excitement may not be an issue for the Bruins, but keeping pace may be a struggle. Kelly named Michigan transfer Wilton Speight the Week 1 starting quarterback, but Speight was knocked out in the first half against Cincinnati with a back injury. It was unclear after Monday's practice if Speight would be available this week, although Kelly said the injury was "nothing serious" and pegged Speight as "day-to-day." Speight's absence forced true freshman Dorian Thompson-Robinson into the lineup. Outside of a 74-yard touchdown run from freshman running back Kazmeir Allen, UCLA's offense sputtered after the switch. "I thought there were some positive things to build upon. There was some inconsistency, but that's to be expected of a freshman in his first game," Kelly said of Thompson-Robinson. "Nothing was too big for him. When you talked to him after a series, he knew what the breakdown was or what the issue was on that play. He has a really good understanding of what we're doing." Thompson-Robinson finished 15 of 25 passing for 117 yards and totaled negative rushing yards under Cincinnati's consistent pressure. "It needs work. My first college game, and it wasn't up to par, up to my standards," Thompson-Robinson said. The offensive outpouring from the Sooners -- coming off an appearance in the College Football Playoff -- looked reminiscent of Kelly's past teams. The Sooners dropped 42 points by halftime and 56 through three quarters on the defending Conference USA champions. Oklahoma quarterback Kyler Murray produced 209 yards passing on just nine completions with two touchdowns in the romp, capably stepping into the void 2017 Heisman Trophy winner Baker Mayfield left. With running back Rodney Anderson rushing for 100 yards on all of five carries and another two scores, the big-play ability of Sooners head coach Lincoln Riley's offense was on full display. "I have been telling people all summer and all spring ... just because Baker is gone does not mean that our offense has fallen off or anything," Anderson said in Saturday's postgame press conference. "We have been grinding just the same. I feel like we are making steps forward." RB Kazmeir Allen provided a spark to a UCLA run game that lacked punch each of the previous two seasons. His 74-yard touchdown run in the second half against Cincinnati highlighted a 103-yard performance on just five carries for the debuting freshman. LB Lokeni Toailoa stepped in for a linebacker corps in need of reinforcements with Josh Woods injured for the season. Toailoa made five tackles against Cincinnati. SS Quentin Lake made an impact as a surprise key figure in the UCLA secondary last week. Lake tallied nine tackles, a tackle for loss and had a quarterback hurry, capably manning the spot Jaleel Wadood handled a season ago. RB Soso Jamabo serves the second game of a two-game suspension in Week 2.